RICHMOND, Va. – It’s been a spring of change for Cindy Chala. Since January, she’s forged ahead in a new country with a new culture. School has been different, the people are new and the tennis has been a revelation. All that change has added up to a pretty successful debut for the VCU sophomore, who will compete in the NCAA Singles Championships this week. Play begins in the singles draw on Wednesday, May 22 at the Khan Outdoor Tennis Complex in Urbana, Ill.
Chala, ranked 76th nationally by the Intercollegiate Tennis Association (ITA), earned the Atlantic 10 Conference’s automatic bid for the field of 64. 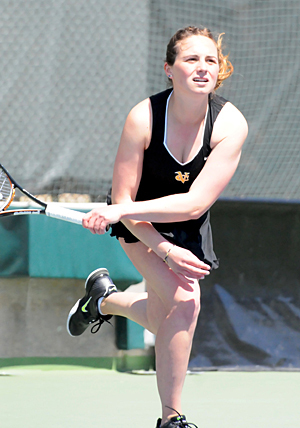 She’s the first VCU woman to earn a berth in the NCAA Singles Championships since Tatsiana Uvarova in 2006. Draws for the singles bracket will be released following the NCAA Team Championship on Tuesday evening. If Chala reaches the quarterfinals, as Uvarova did in 2006, she’ll earn All-America status. It’s been a busy few months for the native of Versailles, France. Chala had been home schooled since she was 13 as she focused on her tennis career. But chronic back injuries led her rethink her options. As is the case for many European athletes, Chala eyed the unique opportunity provided by colleges in the United States to marry their academic and athletic pursuits. The decision has paid off on both fronts for Chala, who is majoring in Business and Psychology, although she had to get used to the inside of a classroom again. She’s gotten acclimated on the tennis court quickly as well. Chala finished 14-4 in singles play this spring for the VCU Women’s Tennis squad, which won the A-10 Championship. Chala’s losses have come to players currently ranked seventh, 12th, 53rd and 77th, respectively, by the ITA. Three of those four have qualified for the NCAA Singles Championships. Chala was named the A-10’s Most Outstanding Player, as well as the ITA’s Atlantic Region Player to Watch, awarded to student-athletes expected to contend for a regional crown in 2013-14. She credits the work of the VCU training staff, as well as Rams’ Assistant Tennis Coach Yana Carollo with keeping her healthy this spring. She also says VCU’s schedule, which usually features one or two matches a week, is easier on her compact frame than the five or six matches a week she played in France. Chala began playing tennis when she was six years old, but jokes that she was “clumsy” and that “nobody wanted to teach me because I was so bad”. But she’s not clumsy anymore. Although she says she’s battled back trouble since she was 13, Chala is healthy as she looks ahead to the NCAA Singles Championships. Like most things during her first year at VCU, from the food, to school, to the people, to the tennis, she says she’ll keep an open mind. Fans can follow VCU’s Cindy Chala, as well as Rams’ senior Max Wennakoski in the men’s draw, at http://www.fightingillini.com/ncaatennis2013/.